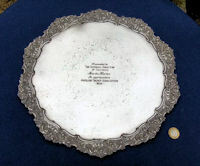 Original, quality rectangular shaped honey coloured oak tea tray with a carved 'egg and dart' mould to the raised outer frame, finger grip cutouts each end and 'bronzed' medallion set into the top right hand corner detailing the coronation of King George VI and Queen Elizabeth in 1937. All in the original finish and complete and in good order. 20" x 14" x 1.25". 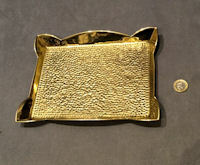 Original, quality 1920's rectangular shaped small brass tray, probably for visiting cards. This example with an Arts and Crafts feel has a shaped gallery and a totally beaten bottom surface. Polished and lacquered, although the lacquer may be removed at no extra cost and complete and in good order. 9.25" x 7.25" x 1". 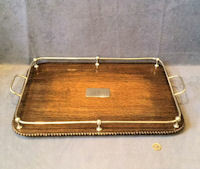 Original, quality late 19th century rectangular shaped oak drinks tray with a nickel gallery with side handles, nickel bun feet to the underside and a central nickel plate for engraving if required. All has been cleaned and refinished with the nickel polished and lacquered, although the lacquer may be removed at no extra cost. Complete and in good order. 23.5" x 13.5" including handles and 3" tall including feet. 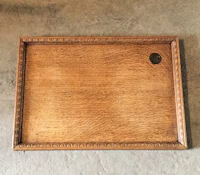 Original, quality oak tray circa 1900 / 1920's with the original nickel gallery with grips to each end, four bun feet to the underside and a central plaque engraved 'B' for a previous owner. The underside also has the original paper label for a retailer "W.W. Kemp & Son Regent House High St Bristol". A super tray, not warped and complete and in good order. The nickel has been polished and lacquered, although the lacquer may be removed at no extra cost. Oak 19.5" x 13.5" and total including handles 21.5" x 13.5" x 2.75". 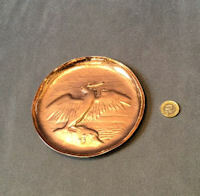 Original, quality 1920's circular copper pin tray or bottle coaster with turned up outer rim and the embossed detail of a cormorant on a rock with the sea and sky behind. This definitely has the signs of a Newlyn piece of copperwork but is not marked as such. Polished and lacquered, although the lacquer may be removed at no extra cost and complete and in good order. 5.75" diam and 0.5" front to back. 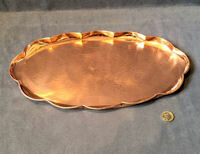 Original, quality 1920's oval shaped copper drinks tray with a 'pie crust' gallery and the detail of a 'Cod type fish to the centre. The reverse is stamped "Newlyn" for the maker. Polished and lacquered, although the lacquer may be removed at no extra cost and complete and in good order. 15.5" x 8.75" and 1". Original, quality, 19th century, silver plated candle snuffer tray, with engraved decoration to the base and raised flower and leaf decoration around the edge of the tray. Complete and in good order. 10.25" x 4" and 0.75". 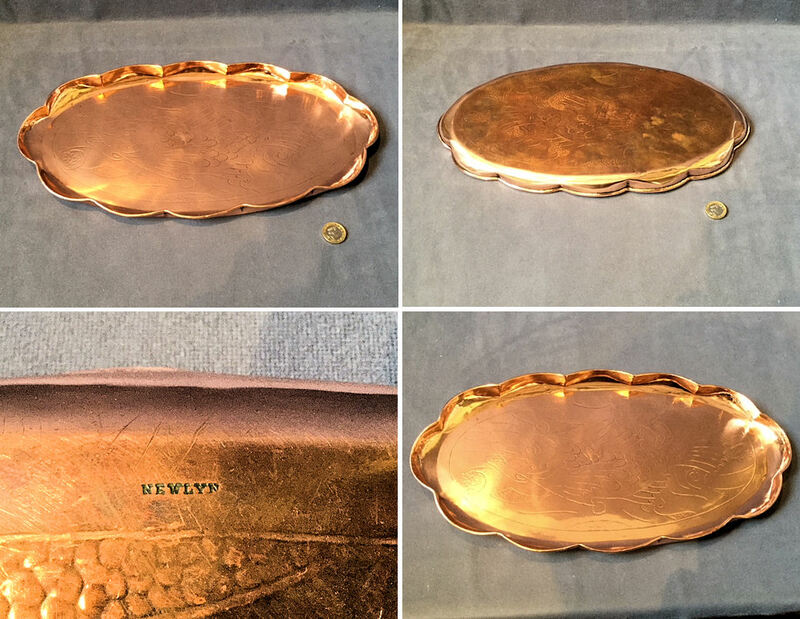 Original, quality 1920's copper oval tray with an embossed crocodile skin design overall and a gallery with a rolled over top rim. This very clean example is impressed 'JS and S' for the manufacturer Joseph Sankey and Sons of Staffordshire. Polished and lacquered, although the lacquer may be removed at no extra cost and complete and in good order. 16" x 13" x 1.25". 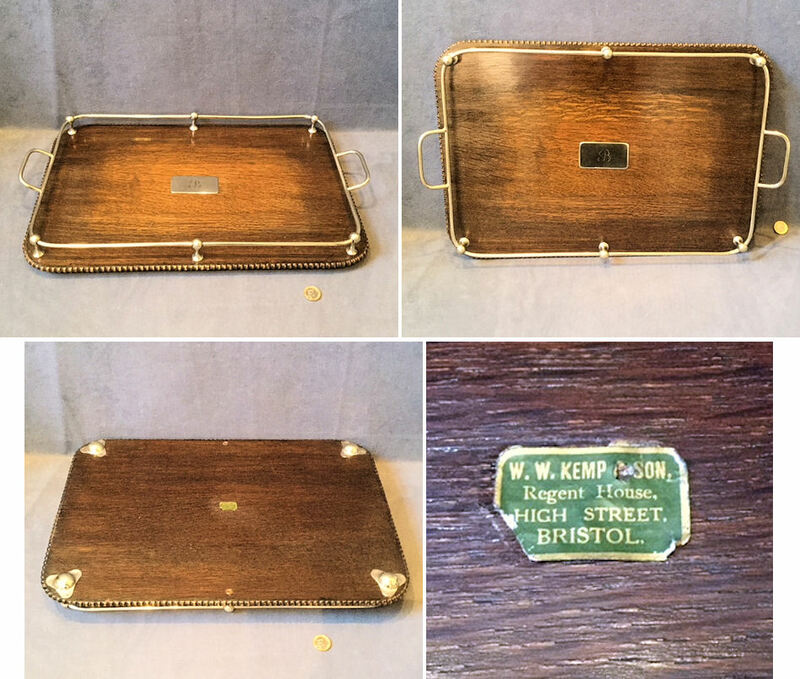 Original, quality 1920's rectangular shaped copper drinks tray with a rolled over rim a hammered finish to the floor, a punched scalloped border design and stamped to the upper surface 'Newlyn' for the 'Newlyn School' in Cornwall. Polished and lacquered, although the lacquer may be removed at no extra cost and complete and in good order. 18.75" x 7.75" x 0.5". 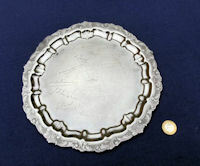 Original, quality 1920's, large silver or nickel plated tea / drinks tray in the Arts and Crafts style. 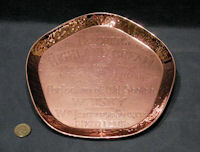 This example is stamped to the reverse for the manufacturer "James Dixon and Sons of Sheffield" and engraved to the front centre "Presented to Hilton Grundy Esq. As a token of esteem from his old boys Oct 1923." The exaggerated shape has a pie crust rim, two handgrip recesses and an overall chiselled decoration. The plating is rubbed in places but not badly and the underside has not been cleaned or polished. A stunning tray, in good working order. 19.5" x 26" and 1.5" front to back. 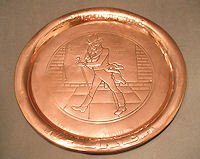 Original, quality 1920's, circular copper drinks tray embossed with a scene of Johnnie Walker striding along the pavement and detailed "Born Eighteen Twenty Still Going Strong". 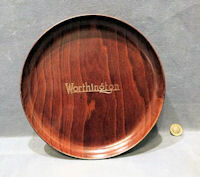 The turned over outer rim is embossed in Art Nouveau form, upper cased text "Johnnie Walker". The top surface has been polished and lacquered, although the lacquer may be removed at no extra cost. 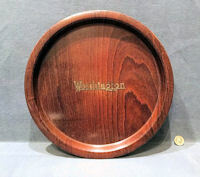 13.25" diameter x 0.75". 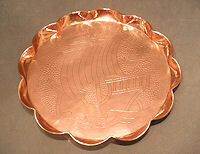 Original, quality 1930's circular copper drinks tray, with a scalloped rim and a hand beaten design of a galleon to the tray, with a background of bubbles. Stamped to the reverse "Handmade". This example was probably made by 'J and F Pool of Hayle in Cornwall' and it has been polished and lacquered, although the lacquer may be removed if required at no extra cost. Complete and in good order. 11.25" x 0.75". Original, quality, oval shaped copper tray, circa 1900/1920's, with deep relief, Art Nouveau design to each end and a rolled over rim. No evidence of a maker's mark, but a serious piece of Art Nouveau copper. Has been polished and lacquered and is complete and in good order. 22.5" x 11.75" x 1.25". 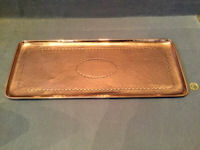 Original, quality, rectangular shaped copper tea tray, circa 1900, with a deep shaped gallery and an engraved border to the base, of an Art Nouveau form. A chunky and useful tray, lacquered, complete and in good order. 19.5" x 14" x 1.5". 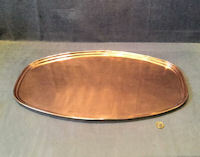 Original, quality, 1920's, oval shaped copper tea tray with a scalloped upturned rim. The floor of the tray is of a beaten design with two mythical fish facing eachother engraved in good detail. 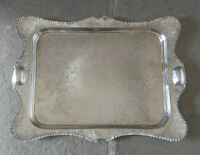 The reverse of the tray is stamped 'Hand Made' but no other makers marks can be found. All has been polished and lacquered and is complete and in good order. 19" x 13.5" x 1". Original, quality heavy brass, oval shaped tea/drinks tray, circa 1900/1920's, with a raised outer rim and open ring handles to each end. 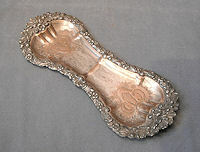 This tray was originally nickel plated and much of this has remained on the underside. The raised border has a rope twist embossed decoration, the handles have a beaded design and the main tray has a repeated motif of acanthus leaves and flower heads around the outer edge and an oval design to the centre. A super quality tray. Has been lacquered, although the lacquer may be removed if required at no extra cost. Complete and in good order. 27" including handles x 17" and 1.75".